Barcode designer tool for Mac OS designs informative, remarkable barcode images using major graphical objects. Mac barcode labels software easily generate multiple copies of same or different barcode images on single paper at a time. Free barcode generator utility saves all produced barcode images in various file formats including jpeg, gif, tiff, png, bitmap, wmf, exif etc. Mac barcode labels software is suitable for all major business organizations such as Automobile industry, Shipping, Warehousing, Libraries, Telecom, Airlines, Retails and much more. Barcode creator tool for Mac facilitates you to copy barcode images and pastes at various applications such as word, paint, excel etc. Mac barcode labels software incredibly generate interactive barcode images that easily scanned and read by all barcode scanners, printers. Download barcode maker program for Mac develop massive barcode images using advance barcode generation methodologies such as sequential, random, constant value series. Mac barcode labels utility supports all linear and 2D font standards including Aztec, Code 11, QR Code, Planet, EAN8, EAN13, MICR, UPCA, UPCE etc for generating barcode images. Free barcode software for Mac creates eye-catching barcode images, labels of different color, style, size, shape, density, dimension, font etc. 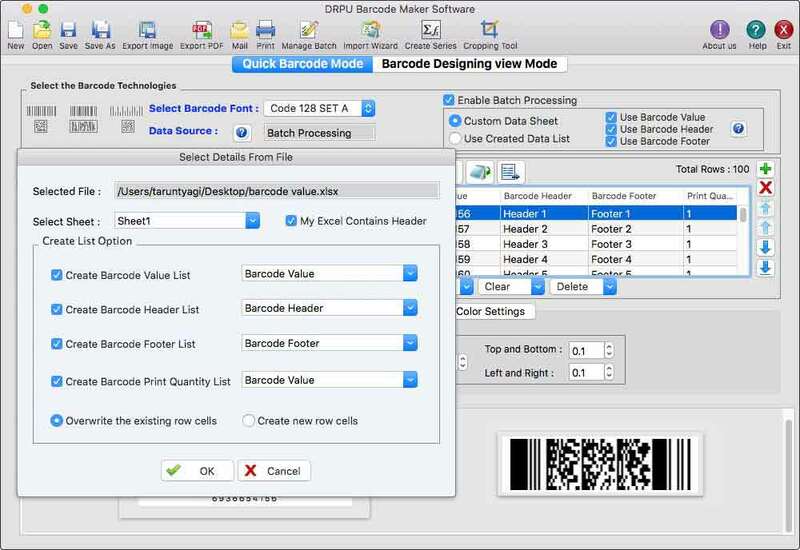 Free download barcode application for Mac provides highly interactive GUI that helps technical as well as non-technical users to understand software settings. Mac barcode labels software successfully installs and uninstall on all latest versions of Mac OS. Software features: * Mac barcode labels software prints large amount of barcode images, asset tags. * Free download barcode tool for Macintosh generates remarkable barcode ribbons, tickets etc in few easy steps. * Mac barcode labels software designs standard barcode images in affordable manner. * Freeware barcode application for Mac creates bulk barcode images, stickers for business usage.